When you think about weather related plumbing problems, you probably think of frozen, busted pipes, but winter isn’t the only season that is hard on your plumbing. Hot, North Carolina summers can present another set of issues for your plumbing. Because no one wants to hassle with their plumbing when they could be relaxing in the summer- we’ve put together a few tips and tricks for common hot weather plumbing issues. Sprinklers, pools, and garden hoses all add up to quite a workout for your plumbing, so it is important to keep an eye out for leaks. Check your faucets, toilets and showerheads for any drips and fix them as soon as possible. Leaks quickly add up to wasted water and increasing water bills. To check for hidden leaks that can turn into major plumbing problems, check your water meter at a time when you will not be using water (often overnight). If your water meter moves over this period, you may have a leak in your plumbing that needs to be fixed right away. Contact a professional plumber to diagnose and fix any leaks. Many people host summer cookouts, so drains and garbage disposals get more of a workout during this time of year. While it may be tempting to use your garbage disposal to help with post-cookout cleanup, it is important to remember that not all food is meant to go down your disposal. Foods that retain water, such as rice or bread, or fibrous fruits and vegetables, like cornhusks and celery, can easily clog your disposals or drains. You should keep potato peels, eggshells and cooking oil away from your disposal. Also, run cold water before, during and after using your disposal to keep from clogging your drains when you need them most. Another common plumbing problem during summer months is sewer line backups. As Angie’s List notes, sewer line problems can cause serious problems for your home and should cause homeowners to take notice. New tree root growth and additional rainfall can wreak havoc on your sewer line. If you have a clogged or backed up sewer line you may notice other drains, such as your shower or tub, gurgle or back up when you flush the toilet or run water. If you notice these signs of sewer line trouble, it is important to contact a professional plumber to inspect and diagnose any problems with your sewer line. For more information about plumbing repair or drain clearing, please visit our website or blog. If you’re in our Raleigh, North Carolina service area, please give us a call or schedule online. 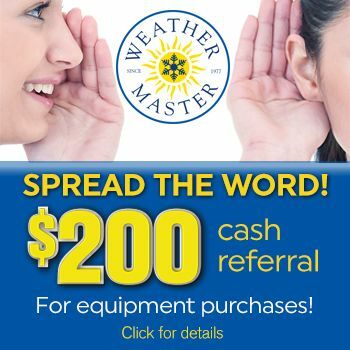 Weather Master has been serving Wake, Durham, Granville, Orange, Chatham and Johnston Counties since 1977. By providing the very best in air conditioning, heating and plumbing equipment, and service, Weather Master strives to deliver world-class service with a small-company touch.